I met one of my favourite authors the other night. It was awesome! Stephen King and Owen King came to Toronto for a PEN Canada Benefit to kick off the International Festival Of Authors on Thursday October 24 2013. I’ve been a Stephen King fan since I was a child. My first introduction to SK was in grade 6, when a friend told me about a really cool book about a competition in the future where a bunch of people start walking. Anyone that slows down or lags behind is killed. The last person left wins. Simple premise. Very entertaining to an adolescent boy. My first question was: what about bathroom breaks?!?! I had to read it. So, I got myself a copy of The Bachman Books and an addiction was born. SK has also been a huge motivator for my own personal writing. I have read and re-read On Writing numerous times. I really enjoy hearing Stephen’s personal story – his early years, his first book sale, his challenges with substance abuse and his family following in his footsteps are all good news stories to me. Stephen King remains a humble, unassuming and completely normal (in spite of his dark and twisted writing!) person to me. It is this sense of normalcy that suggests that his success could happen to anyone. His primary advice to aspiring writers is as everyman as it comes: ““If you don’t have time to read, you don’t have the time (or the tools) to write. Simple as that.” There’s a large chasm between Stephen King’s ability and my own, but he makes the ability to write seem like such an achievable goal. 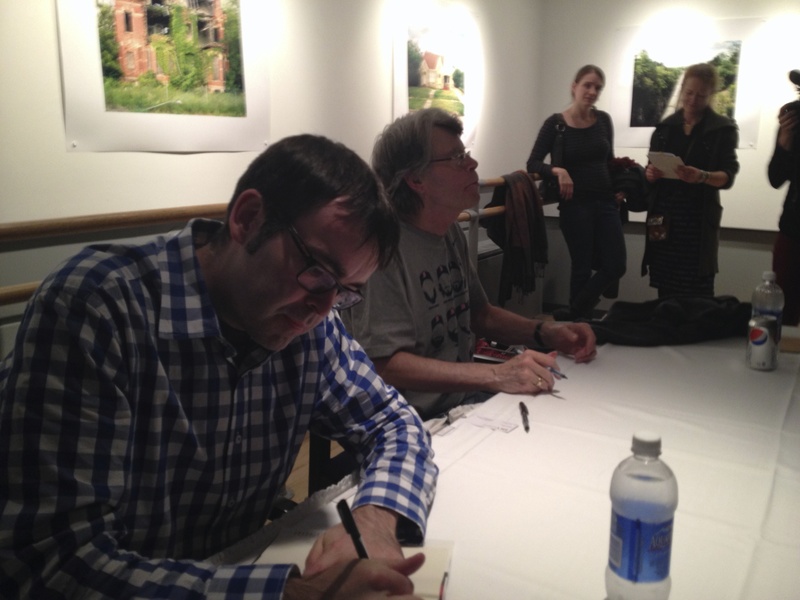 I first heard that Stephen King was coming to Toronto back in April. Tickets to the PEN Canada Benefit went on sale online on April 18 at 1pm. Needless to say, I was ready with web browser in hand at 12:45 on that day! At 1:01pm, tickets were sold out and I had received my email confirmation that I was a lucky recipient of a ticket to see Stephen King! Considering that the event centred around Stephen King and Owen King giving a reading and then participating in an interview, I knew that #1 would be a no brainer. How did the rest work out? Well… here’s my overview of the evening. Give it a read. 400 pre-signed copies of Doctor Sleep were available for purchase at the event, so I was confident that I would be able to get a copy. But, I wanted to make sure that I got a copy early so that I didn’t have to worry about this later on when I was looking for a good seat and/or when I was waiting in line for an autograph. So, I decided to get to the event as early as possible so that I could be at the front of the line to get into the event. I arrived at about 6pm to discover that about 50 people were already in line ahead of me. Twitter informed me that people started lining up at noon! But, I was in a good spot in line, so I wasn’t too worried. By 7:30, the hallway outside of the theatre was abuzz with excitement. The doors opened and in we went. My first stop was the book table. I had to get a copy of Doctor Sleep. They were charging full price for books ($37), which was fine with me considering that Stephen King had autographed the books ahead of time. Fantastic souvenir of the event! To me, it was a keepsake that I’ll hold onto. But, to others, these books are investment that have the potential to pay off quite well. More on that at the end of this post. Next up was to find a good seat. I headed for the auditorium and quickly discovered two camps of people: those that wanted seats as close to the stage as possible and those that wanted seats as close to the exit as possible. Luckily, most of the people leaned towards the former group so I had a good chance to get my getaway seat by the doors. I grabbed my seat and eagerly awaited my chance to see Stephen King live in person. PEN Canada’s presentation was quite moving, as it highlights the challenges and persecution that others have to deal with on a daily basis. It reminded me of the freedom that we have in Canada. I have hesitated to share some of my writing for fear that others might take offence or be critical of my thoughts and feelings. But after learning of Dieu Cay’s challenges, it lit a fire in me to complete some of my own writing and to share it wherever possible. Next up were Stephen and Owen King. They both provided a reading from their latest books. Stephen read a section from Doctor Sleep. Owen read a section from Double Feature. The biggest thing that stood out for me was the inverted technology choices: Stephen read from an iPad. Owen read from a book. Based on how quickly Stephen was swiping pages, I am guessing that Stephen’s font size was quite large – perhaps that is the main reason that Stephen was using the iPad. Stephen’s reading was taken from Chapter 4: Paging Doctor Sleep. 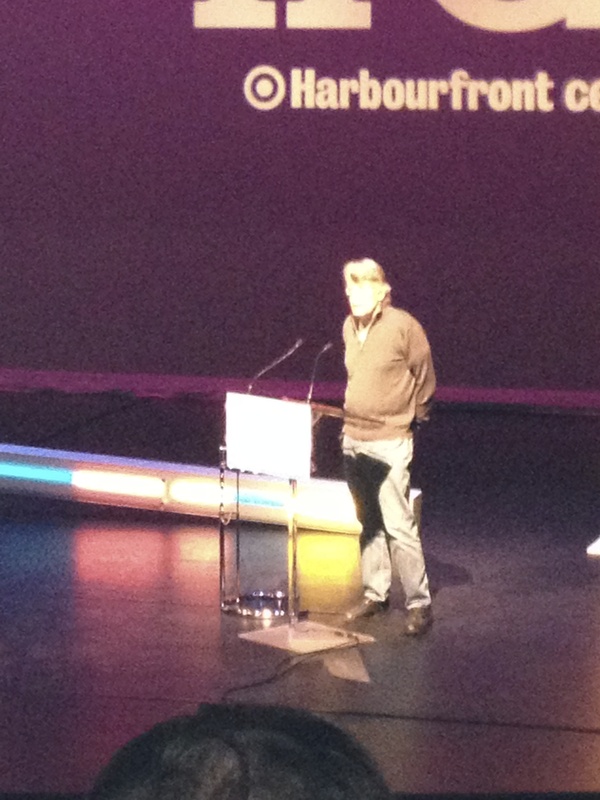 It was great to hear Stephen King read his own writing. Having already read the book, there were no surprises here for me. It was nice to simply listen to him read. Stephen prefaced his reading by explaining a bit about the subject matter of Doctor Sleep. Commenting on the disturbing nature of some of his writing, he remarked, that many people pay $90 or more an hour for therapy to deal with fears, phobias and other challenges. He deals with this stuff by writing it all down. And the best part is that he gets paid for it! Owen prefaced his reading with a story about his “dirty bookstore reading”. He warned us about the adult subject matter that he’d be reading. Owen has read this section at previous book readings, including a book reading in Portland, Maine. At that particular reading, the most graphic part of his reading coincided with the arrival of a small child, far too young to hear the strong language and sexual content being read, in the audience. The kicker to this story was that as the child appeared, Owen happened to lock eyes with a famous passerby, F Lee Bailey, who mischievously nodded approvingly of the situation. Owen’s entertaining introduction to his book, along with the entertaining nature of the reading itself, convinced me to pick up a copy of his book before the night was out. After the readings, Stephen and Owen were joined onstage by Andrew Pyper, the author of six internationally bestselling novels, including his most recent book, The Demonologist. Andrew facilitated a great conversation, dedicating time equally between father and son, encouraging thought provoking and entertaining discussion. When asked about whether Owen was thinking of his famous father in his writing about a particularly dysfunctional father figure in his book Double Feature, Owen said that he could write about Virginia coal mines and people would ask if the hills or the mines were metaphorical representations of his dad. And for the record, he did clarify that this particular character was not based on his interaction with his dad. The discussion turned to similarities between humour and horror. Stephen King mentioned that we all have a mean streak in us – and that we like it (whether we admit to it or not). And he also said that humour starts turning into horror when the target starts being you. When asked if people or places are haunted, Stephen replied by saying that he believes that both occur. Stephen suggested that we leave residue of ourselves in our wake. As the interview wrapped up, a large number of people (approx 25 or 30 in total) started to leave the theatre. I knew where they were going: to get to the front of the line for the post-interview book signing! I was eager to join them, but wanted to wait until the last possible moment before leaving. As these people started to leave, others in the audience got upset, yelling out that they were being rude by leaving early. It was uncomfortable for a couple of minutes as this group departed. Shortly after that, Pyper wrapped up the conversation by thanking Stephen and Owen for coming. I took that as my queue and I snuck out the back to get into line for the book signing. I arrived in line to find the earlier auditorium departers waiting patiently for Stephen King to arrive for the book signing. There were about 40 people in front of me in line at that point. 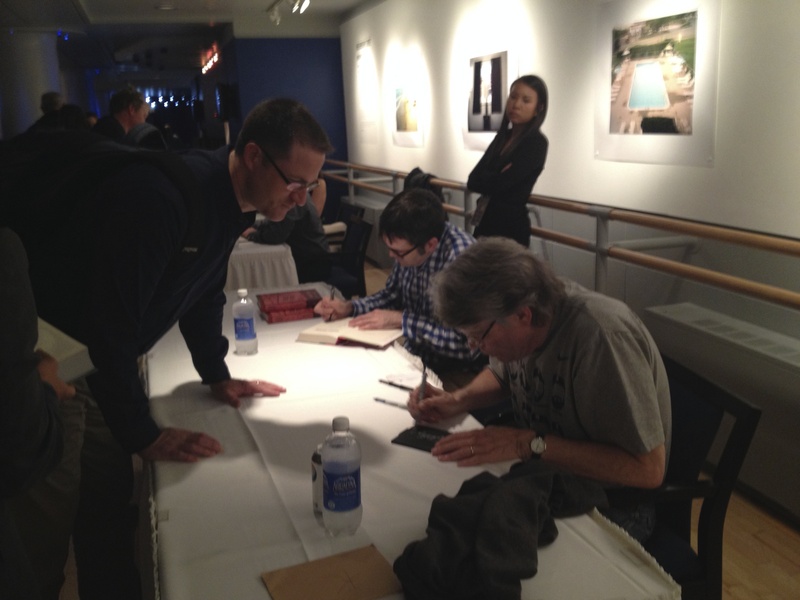 But, next up was the big finale for me – meeting Stephen King in person and getting him to autograph my Kindle. Getting Stephen King to sign my Kindle made me a bit nervous. Several factors: Stephen King was only going to sign books for 1 hour. If there was a long line, would I get to the front of the line in time? What would I use to sign my Kindle? Would he sign it? A bit of planning made sure this happened. The book signing was happening after the main event. So, as per the advice of a couple of literary friends of mine, it was suggested that I sit at the back of the auditorium so that I could slip out of the auditorium just before the main event ended, thus getting to the front of the line before everyone else came rushing out the theatre to join the line. This worked well, but as I mentioned above, some other people had the same idea. After a bit of a wait, Stephen and Owen came out of the auditorium and over to the signing table. The line behind me started to fill up. And, the line started moving. As I got closer to the front, several “handlers” scanned the line, ensuring that people only had one book to sign. They also started asking people to open their books to the page they wanted signed. Finally, it was my turn. At the signing table, a handler took the book from the person in line and handed it to Stephen, who would then put his autograph on it. I handed my Kindle and my silver sharpie to the handler. He looked a bit puzzled for a moment, looking at me to make sure. I said yup, he shrugged his shoulders and handed it to Stephen King. Stephen looked up at me questioningly, I smiled and asked him to make his signature as big as possible – fill the back! and off he went, signing my Kindle. I asked another of his handlers to take some pictures of me with Stephen King. When he was done signing, I shook his hand, thanked him for signing and I moved on. No time for chit chat! I slid down the table to Owen and got him to sign his book for me as well. From there, I packed up, and headed for the door. As I looked up, I understood the reasoning behind the smooth machination of the book signing: 400+ people in line is a lot of people! The lineup of people behind me in line snaked through the lobby, down the stairs and around the downstairs lobby of the theatre. I still don’t know if everyone had a chance to get a signature from Stephen or Owen King. I do know that Owen must have wrapped up at the hour mark, because he retweeted one of my tweets shortly after 11pm. I would assume that they wrapped at 11 and left for their hotel rooms shortly after. All in all, it was a fantastic night and I managed to accomplish all of my goals for the evening. I headed home, souvenirs in hand. My research leading up to the event highlighted the resale market for signed memorabilia. 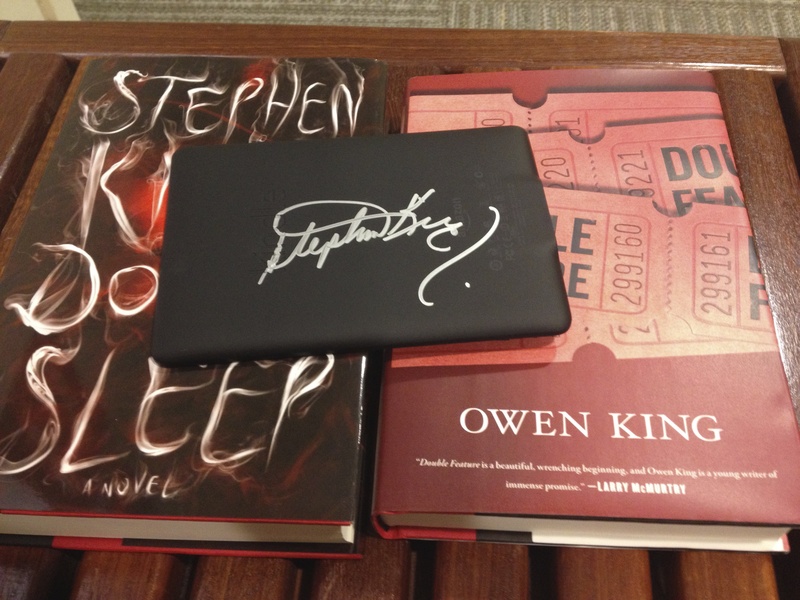 I have no plans to part with my signed copy of Doctor Sleep or my signed Kindle. But I do know that some people approach this as a business. So, I did a quick check online to see if there was suddenly a glut of signed Doctor Sleep books on the market. 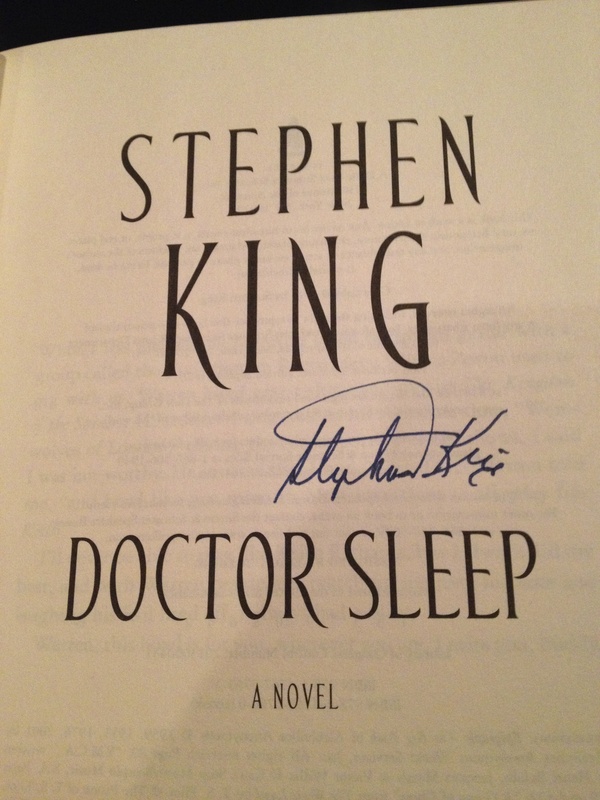 Sure enough, ebay had a couple of listings for newly obtained signed Doctor Sleep books straight from the Toronto event. Average selling price was $400! I was stunned. My $37 purchase could be flipped for $400 within a couple of days. No wonder people have such an interest in memorabilia and collectibles. That said, I’m keeping my book and Kindle as a reminder of a great night meeting one of my favourite authors.